This a quick and easy meal on a summers day that needs very little preparation, and tastes fantastic. To make the dressing combine 4 tablespoons of mayonnaise with chopped anchovies, capers, finely diced shallot, worcestershire sauce, tabasco and pepper to taste. In a hot frying pan sear the chicken fillets for 4 minutes, and then turn, add the slices of prosciutto to the pan and roast in an oven at 200C for about 10 minutes depending on the size of the breasts. Check by feeling for 'springyness'. If unsure pierce with a skewer and look for clear juices escaping! Once cooked remove and keep warm. Meanwhile poach an egg for about 6 minutes so that the yolk is runny! Chop the lettuce, deseed the tomato,slice and toss together with crumbled prosciutto. Dress with flavoured mayonnaise and serve on a plate. 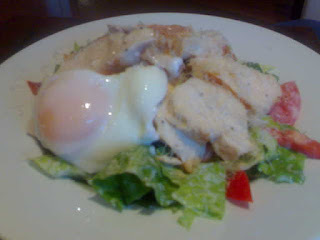 Top with sliced chicken breast and finally the poached egg. Grate over parmesan and season with black pepper. It shouldn't need any salt with the salty prosciutto, anchovies and capers.